Place a frying pan on your Pineware double spiral hot plate and fry the sausages in oil over a medium heat until nicely browned. Add onions and garlic and fry for 5 minutes. Add mushrooms and fry for another 5 minutes. Add thyme, bay leaves, stock and carrots, return sausages to saucepan, cover and simmer for 30 minutes. Thicken the gravy with cornflour and water, season to taste and serve with mashed potato or chunky bread rolls to mop up the gravy. 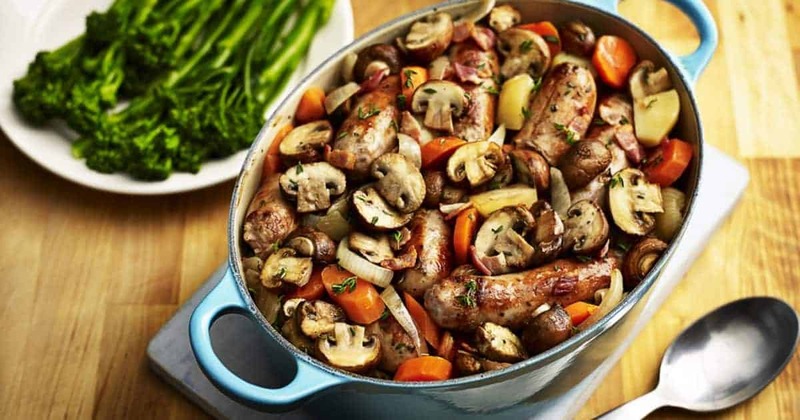 Hey Buddy!, I found this information for you: "One-pot sausages with mushrooms and gravy". Here is the website link: https://www.pineware.co.za/recipe/one-pot-sausages-with-mushrooms-and-gravy/. Thank you.